(Phys.org) —A second-generation smartphone cubesat as well as a nanosatellite deployment system, launched into space Tuesday from the Virginia coast. 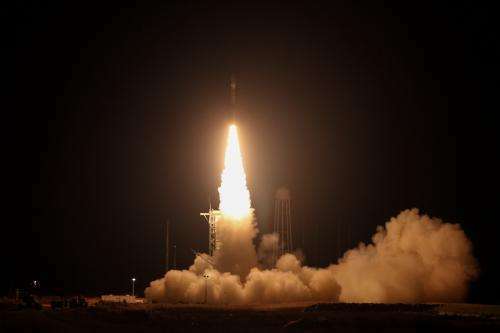 The cubesats were included as auxiliary payload aboard a U.S. Air Force Minotaur 1 rocket that lifted off from the Mid-Atlantic Regional Spaceport at NASA's Wallops Flight Facility at 5:15 p.m. PST. The launch marks the first flight several components of the Nanosatellite Launch Adapter System (NLAS), built by NASA's Ames Research Center in Moffett Field, Calif. The NLAS is capable of carrying approximately 100 pounds of secondary payloads into orbit, and can accommodate various configurations of cubesats. "NLAS will enable NASA and academic opportunities to fly nanosatellite missions as secondary payloads on many government sponsored launches. " said David Korsmeyer, director of engineering at Ames. "With an expected orbital life-time of up to two years, PhoneSat 2.4 will measure and validate the performance of commercially-developed components in space," said Deborah Westley, PhoneSat project manager at Ames. Cubesats are a class of research spacecraft called nanosatellites. The cube-shaped satellites measure about four inches on each side, have a volume of about one quart and weigh less than three pounds. Cubesat research addresses science, exploration, technology development, education or space missions. Also onboard were cubesats research satellites from nine universities as well as the first developed by high school students. The cubesats, NASA's fourth Educational Launch of Nanosatellite (ELaNa) mission, deployed from their protective cases into Earth's orbit 20 minutes after liftoff. The TJ3Sat from Thomas Jefferson High School for Science and Technology of Alexandria, Va., contains a voice synthesizer that will take written phrases in the form of code and produce a phonetic voice reading on the satellite's downlink frequencies. TJ3Sat is the first NASA-sponsored cubesat developed by high school students.